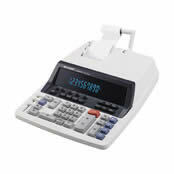 The QS-1760H is a convenient and user-friendly 2 color printing calculator with an easy-to-read 10 digit blue fluorescent display. Print 10 numerals, 2 symbols, and 3-digit punctuation in two colors (positive numbers in black, negative numbers in red). include independently accessible 4-key memory, average keys, item counter, 2-key rollover, double zero key, sign-change, and right-shift keys. This page is part of GeneralManual.Com Network SHARP QS-1760H Commercial Calculator User Manual.